The oddsmakers keep revising the betting odds for whether or not I will run the marathon on November 10, a mere six weeks away. I had pretty much resigned myself to bowing out of the race due to plantar fasciitis, but then a devilish little birdie whispered in my ear. “Come on. Just take a look at your training plan. Let’s think about how you could juggle the long runs and get back on track. See how you do and then decide.” I listened to that little devil and ran 12 miles last Sunday, a three-mile aqua jog on Monday, followed by another six on the trails on Wednesday. Those runs felt okay, not great. Good enough to continue. So this Saturday morning I watched the sun rise as I started out for what I hoped would be 15 miles, a new personal distance record. I jogged along the dirt path, shunning the asphalt trail, all the better to pamper my delicate feet. Hair brushed? Teeth brushed? Sunscreen? Shoes? Remind remind remind children eleventy-billion times until the answer is yes. Remind 7-year-old to get out the laminated “Good Morning Checklist” we made last year so I can stop reminding them! Ensured that all the necessary papers were signed in all the necessary places. That sounds easy enough but for two elementary school children, that meant no less than FIVE signatures. (1) Homework for 7-year-old, (2)-(5) agenda, practice spelling test, reading log and pass-back folder for the 10-year-old. RIDICULOUS. Helped 7-year-old practice her poem recitation one last time. Remembered it was picture day and remembered to (finally) log on the computer to choose portrait styles and pay for them and print the receipts for the girls to take to school. My point to myself being, I have some things on my plate that shove “extraneous running gear shopping” to number 95 on my to do list. So I stopped berating myself and got on with the run, which actually felt great. Well, oddsmakers, what do you think now? Worst trail view ever. Might as well be running ON the 91 freeway. It was all downhill after that, and I finished the last two miles strong. 15 miles in 2 hours 20 minutes, for a pace of 9:22, ahead of my training goal pace of 9:26. I stretched, ate a PB&H sandwich on whole wheat, hurried home, became intimate with my foam roller, soaked in an Epsom salt ice bath, showered, put some arnica gel on my feet and iced them for a bit. Whew! 15 miles in the bag! All those fruits and vegetables came in the large box delivered to my pick-up location, less than an hour from the farm. Now that’s fresh! I know the zucchini had just been picked because I could still feel the little prickly “hairs” on the green skin. The vibrant red tomatoes smell like tomatoes should, as if you could taste the sunshine that ripened them on the vine. How does a CSA work? You pay a flat fee to subscribe to the CSA and receive your share of farm fresh produce every week (or every other week, depending on your plan). 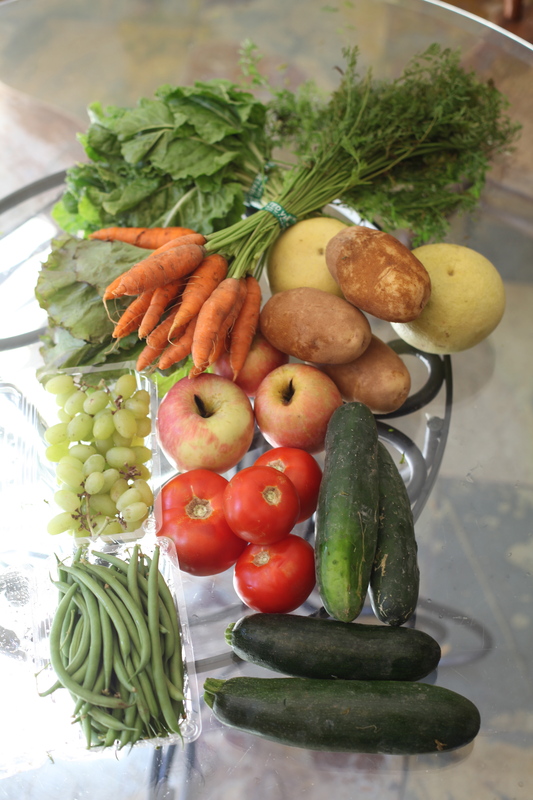 You do not get to choose what comes in your box each week; you literally share in the weekly harvest on the farm. That’s one of the wonderful things about a CSA — you know you are getting local food that is in season. It hasn’t been grown halfway across the world and spent days being shipped to you before it sat in the store. By participating in a CSA, you are helping the environment with a reduction of the burning of fuel to ship the produce, and with the support of earth-friendly organic farming methods. As a bonus, because the fruits and vegetables are so fresh, they last longer once you bring them home. Something that might wilt or wither a few days after purchase from the grocery store can last a week or two when it comes straight from the farm to you. What’s the downside to a CSA? To me there’s no downside, but I will say that it can seem pricey if you’re used to buying conventionally-grown produce from the grocery store. Furthermore, in a typical CSA, while you share in the bounty of produce, you also share in any decline in production due to drought, flooding or pests. Some CSA farms will supplement their produce under agreements with other local farms to make up any dips in production and to provide a little more variety to the boxes each week. So what did my four-year-old and I have for lunch? Grapes, cucumbers (with hummus), and apple slices. My older girls gobbled the other apples for an after school snack, and the red leaf lettuce and cucumbers made it into our dinner salad. The farms often provide recipes to teach you how to prepare unusual vegetables (my CSA favorite is kohlrabi with olive oil and salt!) and use up your produce. I have seen news articles lately that declare that organic produce is no more nutritious than conventionally grown food. That does not bother me at all. The better flavor alone is worth any extra cost! 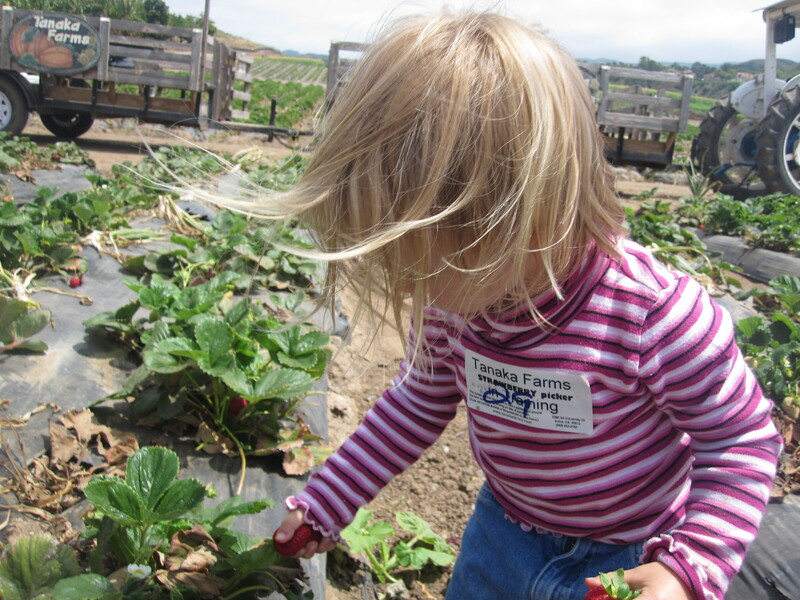 I dare you to taste test a conventionally grown strawberry versus an organic one. Then consider the fact that organic food is not grown with chemical fertilizers and pesticides. Add in the freshness of my organic CSA produce and the environmental benefits of organic farming methods, and I’m sold on organic food! To find a CSA in the United States or Canada, go to Local Harvest and search for your location. Do you have a share in a CSA farm? Do you buy organic produce? Why or why not? Yes, it’s my beloved Star Trac NXT Spin Bike that I ride in my favorite Cycle Sculpt class at the gym. Because my road bike shoes do not fit the cleats on the indoor spin bike, and I do not (yet) have the right indoor spinning bike shoes, I have been wearing my regular running shoes in the pedal toe clips. That means that when I add resistance and stand up on the bike, all my weight rests on the balls of my feet and strains the plantar fasciae. (This is my non-medical, my-own-experience your-mileage-may-vary opinion of what’s happening). How do I know this? My feet were feeling surprisingly great a few days after racing in the triathlon a week ago. I got back on the spin bike for a 40-minute workout and I ended up with a major flare-up of the plantar fasciitis. The spin bike hadn’t bothered me when I remained seated for an entire Cycle Sculpt class, and my hour-plus outdoor bike ride for the triathlon didn’t bother me, but just 40-minutes and a few intervals of standing up on the spinning bike strained my feet. I’m not saying it’s the sole culprit, but it’s definitely a big contributor. I’m not going to give up spinning, but I will certainly stay seated on the bike until I can buy some proper indoor cycling shoes. The good news in all this is that I do not think running is doing as much damage to my feet as I thought. I got out yesterday for a 12-mile run (if you could call it that — I’d be more inclined to call it a slogging 2 hour 15 minute jog). While my feet weren’t exactly thanking me, they feel pretty good today. Better than my aching thighs and hips! Clearly I’ve lost some fitness in the last few weeks of dealing with the plantar fasciitis, but I’m determined to get back on track, so to speak. What are your thoughts on my theories as to what has contributed to the plantar fasciitis? If you’ve dealt with PF, what do you think caused it? Do you have a recommendation for good indoor cycling shoes? It was bound to happen sooner or later — my first meme! Thanks to the ladies at anothermotherrunner.com for the inspiration. Feel free to play along in the comments or answer the 10 questions on your own blog. I’d love to read the answers! 1. 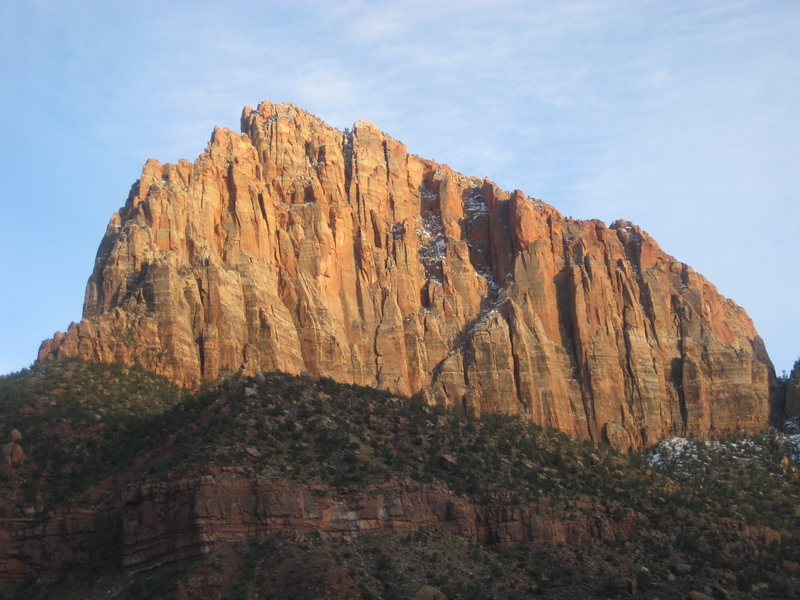 Best run ever: It’s hard for me to say what I consider the “best.” The one I’d most like to repeat is a 2.7-mile trail run I did in Zion National Park. It was just one month after I’d gotten back into running about a year and a half ago, and this was one of the first runs where I felt strong, powerful, and free. I was distracted by the spectacular views and by watching my footing. The view at the start of my run in Zion National Park. 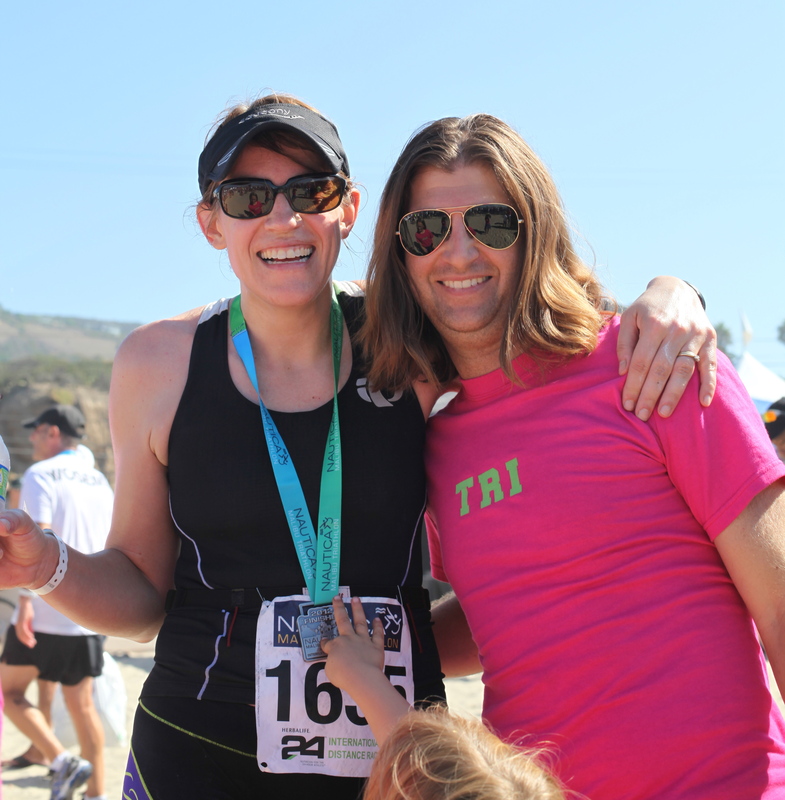 The run I’m most proud of is the OC Half Marathon last May 2012. It was my first and only half marathon. I pushed myself hard to achieve my goal of a sub-2 half, and while I didn’t exactly enjoy the effort, I was extremely happy and proud with the result. 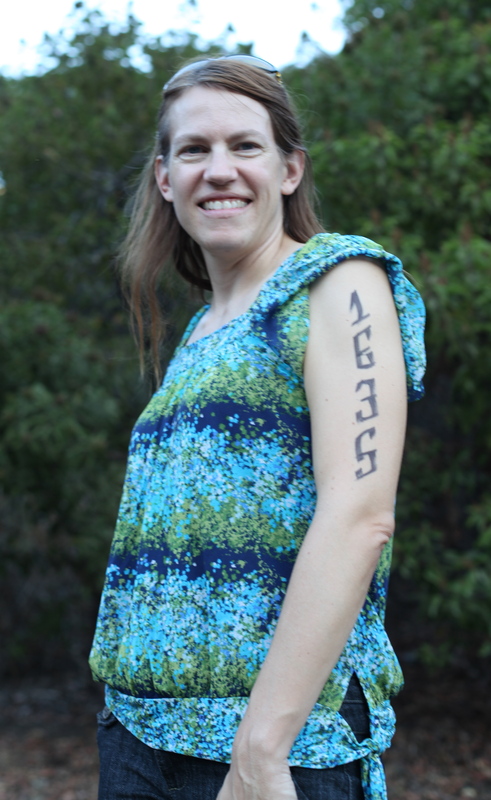 My best run ever in terms of fitness and confidence-boosting was the 13 mile run I did with my half marathon coach and friend Stephanie last August. The first six miles went smoothly and I felt so great when I met up with Stephanie at the half way point that we ran faster than my target training pace. Not only did we run faster, but I was having so much fun chatting with her that I forgot to keep track of the mileage and we ran a bonus mile to make it 13. If I’d thought about it I would have tacked on another 0.2 for a personal distance record! 2. Three words that describe my running: Challenging, rewarding, powerful. 4. Quirky habit while running: I am a mouth breather, but that’s not so unusual is it? Sometimes I run while listening to an audiobook, but I typically run without a book or music. 5. Morning, midday, evening: If I have my way, I run in the morning, preferably before my husband and three girls are awake. I love coming home to find them all still sleeping. They haven’t missed me, and I feel a huge sense of accomplishment at having checked off my training for the day before my family’s day has even started. That said, I have been known to run at 8 p.m. if that’s what it takes to get my training run in. 6. I won’t run outside when it’s: Hmm. There hasn’t been a time yet when I wouldn’t run outside. 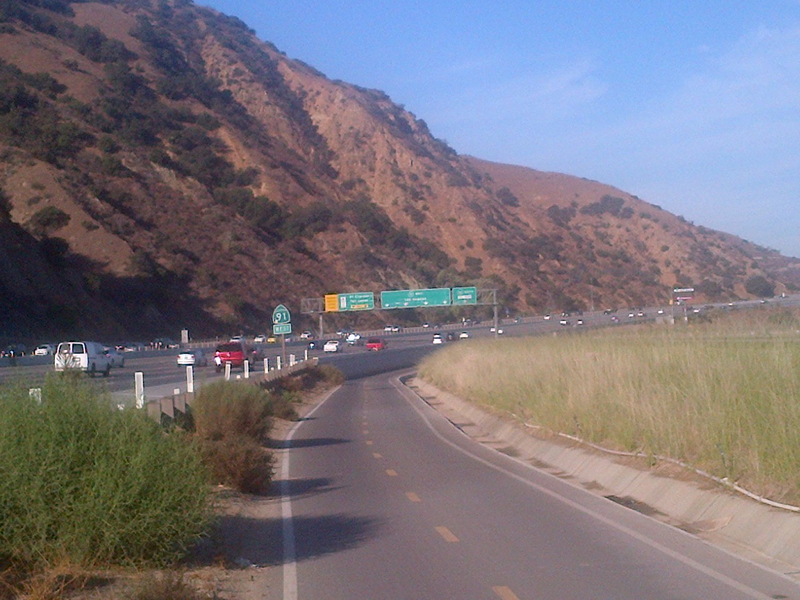 Southern California is pretty weather-friendly for running and I don’t let the heat stop me. I try not to run in the dark. I’d prefer not to run in a thunderstorm or on icy roads. I do like to run in a light rain though — it’s a nice change for me! 7. Worst injury—and how I got over it: Plantar fasciitis. It’s been a few weeks and I’m still getting over it, physically and mentally. Send healing vibes! I feel like my feet are my new job — stretching, strengthening, rolling with the tennis ball, icing, massaging with arnica gel, resting, and wearing the Strassburg sock(s) at night. I just read that American Olympian Ryan Hall has dropped out of the New York City Marathon due to plantar fasciitis and other problems. If an elite runner can be sidelined at this point by plantar fasciitis for his November 4th marathon, maybe I shouldn’t feel bad about missing my November 10th one. 8. I felt most like a badass mother runner when: In the middle of my half marathon training plan, I went out for a Saturday long run on a local trail. I could hear a guy running behind me, but I kept up my pace and he did not catch up to me until we had to stop at a road crossing. He asked me what I was training for, and I practically burst at the seams with pride. I looked like a runner! A stranger knew I was training for a race! I told him about the half marathon and my sub-2 goal, and he told me exactly what I needed to hear at that point: “You can do it! You’ve got it!” Amazing how people come into our lives out of the blue and offer us such wonderful little gifts. It didn’t cost him anything and yet his words gave me so much. 9. 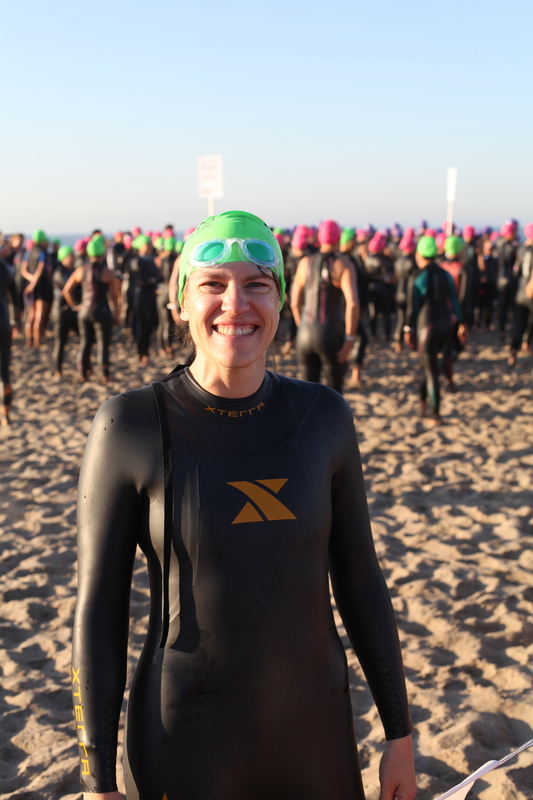 Next race is: My next race is the SheROX San Diego sprint triathlon in October. My next running race on the calendar is the Santa Barbara International Marathon in November, but that’s looking to be my first DNS in light of the plantar fasciitis. I’m proceeding with my training by aqua jogging in the pool (and biking and swimming), and I’ll either try to downgrade my registration to the half marathon, or skip it altogether and set my sights on another marathon. I’ve been reading Ironman champion Chrissie Wellington’s new book A Life Without Limits: A World Champion’s Journey (book review spoiler: I love it!) and I found it pretty inspiring to read how she had to miss the 2003 London marathon due to a hematoma in her left thigh. Instead of running the race, she enjoyed watching it live as Paula Radcliffe broke the world record. That story reminds me to keep a positive attitude and stay in the game for the long haul. There will be another race for me. 10. Potential running goal for 2013: If I cannot start/complete the marathon in 2012, I will look forward to 2013 and the chance to try again. Perhaps the LA Marathon in March? Answer one or more of the questions in the comments or come back and post a comment with the link to the answers on your blog!